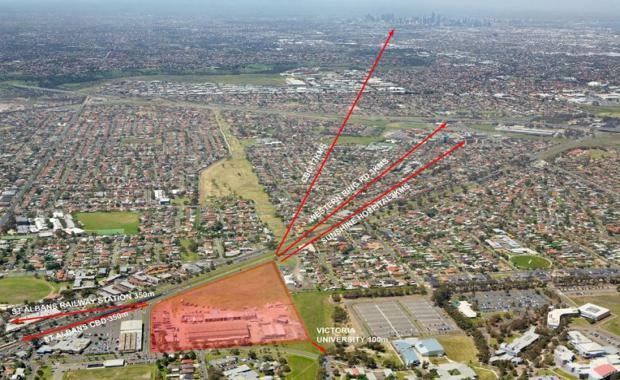 Developer Cedar Woods Properties has received the green light from Brimbank City Council for a $100 million urban renewal project in St Albans. Cedar Woods’ St. A project on the 6.8 ha former Kruger Transport site will deliver around 250 six star energy rated homes and apartments within 300 metres of St Albans station. The St. A project, together with the recently announced $480 million package of works including the rebuilding of St Albans and Ginifer stations and level crossing removals at Main and Furlong Roads in St Albans, will be a major catalyst for change in the St. Albans area, just 16km northwest of Melbourne’s CBD. “There are few, if any, major housing estates whereby purchasers have the ability to walk to a train station, bus terminal, established shops, childcare centres and Victoria University, and all within 30 minutes from Melbourne’s CBD. “Government and key stakeholders should be commended for funding and delivering infrastructure that will generate significant employment opportunities in St Albans and positively impact the lives of people within one of Melbourne’s major growth areas."St. A gives Cedar Woods further exposure to sites located adjacent to major government infrastructure projects. The St. Albans Shopping Centre is located 350m from the residential development. Mr Blackburne said this represented a considerable lifestyle potential in an excellent location. “The St. Albans activity centre is a thriving hub for the north western suburbs, with a village- like urban character. People drive from afar to take advantage of the fantastic fresh and multicultural food options,” he said. Civil works on the former industrial site are scheduled to commence around the end of the year and project completion is expected in mid 2019. The first sales release is expected in late 2015 and buyers are able to register their interest for priority access to the initial release of homes.